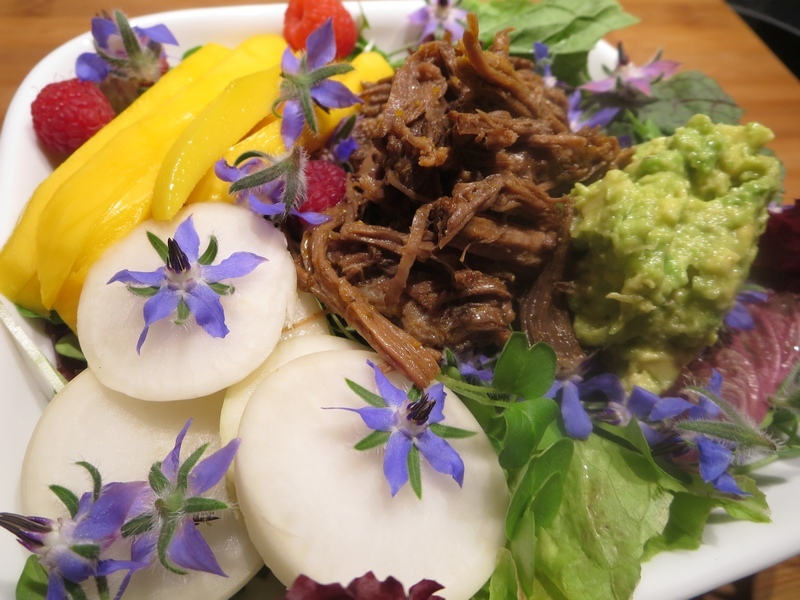 This traditional Mexican main dish is slow cooked using beef cheeks and brisket or goat meat. Try my version below using an electric pressure cooker to speed up the process and infuse Mexican flavors into every bite. Benefits: This large batch will feed a crowd of 10-12 or provide batch-cooking leftovers to freeze and heat up during the busy work week. Using pastured beef (grass fed AND finished) ensures a healthy fat profile. Prepare roast. Trim off an excess fat leaving about a 1/4-1/2-inch layer on the surface. Save the excess fat for rendering later. Place roast in an electric pressure cooker. *See optional directions below to use a slow cooker such as a crock pot. Prepare sauce by combining the apple cider vinegar, garlic cloves, cumin, oregano, black pepper, salt, oil, broth, limes and chipotle chilies in a blender and process until smooth and well combined. Pour sauce over roast. Place bay leaves around roast. Secure pressure cooker lid and set timer for 120 minutes. When cooking is complete let cooker cool. Remove meat and let rest for 20 minutes. Carefully remove and discard the bay leaves. Then shred meat with two forks. Use the leftover sauce to flavor and moisten the shredded beef as desired. Serve meat over salad, as a filling for tacos or burritos or with a side of rice. I also like the meat served over a baked sweet potato. Package up any leftovers in glass storage containers, label and date and freeze for later use for a quick meal. Place prepared roast, sauce and bay leaves in a slow cooker. Cook on high for 2 hours. Reduce temperature to low and slow cook for 5-6 more hours until meat is fork tender. Shred as described above.